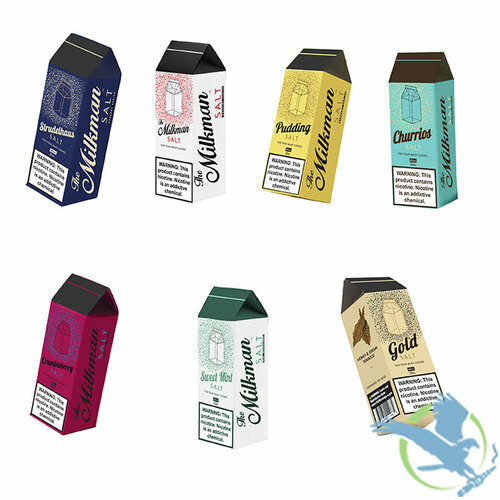 The Milkman E Liquid released the original version of this product to such demand finding it was difficult and going through an entire bottle in a day as an easy feat. Now in salt nicotine formula you can enjoy this hero of vaping folklore in your favorite pod mod systems without much effort. Satisfy your need for creamy goodness in a fashion very few can ever achieve. Warm, Fluffy churros sprinkled with sugar and cinnamon, covered in that signature fresh milk, you've come to know and love. A rich and decadent, creamy vanilla pudding with sweet lemon overtones that hdanily meets the high standards of excellence you've come to expect from The Milkman. A fresh and sweet raspberry flavor paired with light pie cream and a crispy crumble crust. If you’re looking for a light and fruity dessert flavor, you can count on Crumbleberry. A warm and flaky strudel loaded with sweet blueberries, filled with cream, and topped with powdered sugar. A classic full-bodied tobacco flavor complemented with rich honey and decadent cream. You can't go wrong with this perfect marriage of three delicious flavors.